In the past few months, we’ve seen incredible momentum in the United States for our leaders to take bold, concrete action on climate change and environmental justice. From the halls of Congress to dinner tables and schools across the country, there is growing energy and momentum to address the climate crisis. Whether it’s the movement calling for a Green New Deal, youth striking for climate around the world, or Southern justice leaders bringing the message of Justice First to DC, climate action is finally getting the national attention that its urgency demands. Now, it is more important than ever to educate and mobilize organizations, individuals, and decision-makers about what it means to be a real climate leader. We don’t have time for false solutions or empty talk without real action. Simply put, to avoid a climate disaster we need to stop forest destruction and prioritize forest protection. For Dogwood Alliance activists, this is what we want to hit home with our policymakers day in and day out. That’s why today, on the International Day of Forests, grassroots action-takers across the nation are urging members of Congress to stand up, protect America’s forests, and hold the US forest industry accountable for its contribution to climate change. At a time when we should be protecting forests, the US is cutting down our own forests at one of the highest rates in the world. In fact, right here in the Southern US, our forests are logged and degraded at a rate four times higher than that of South American rainforests. 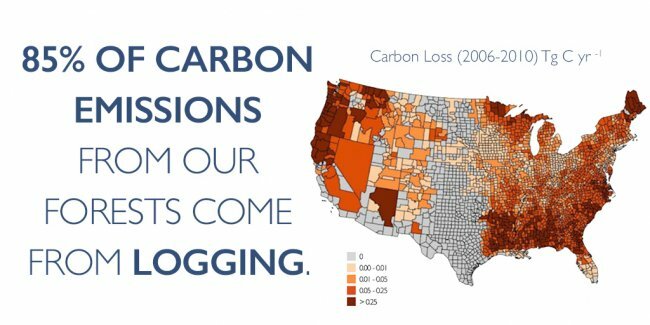 Keeping forest carbon in the ground is as important as keeping fossil fuel carbon in the ground. We can only meet our climate goals if our leaders embrace forest protection as a critical climate solution. To make this a reality, last year Stand4Forests launched with the support of over 200 organizations, scientists, and elected officials with a bold vision for forest protection in the US — and we continue to grow every day. The Stand4Forests movement is united in our belief that forests are the bedrock of strong and safe communities, thriving local economies, a stable climate, and a livable planet. 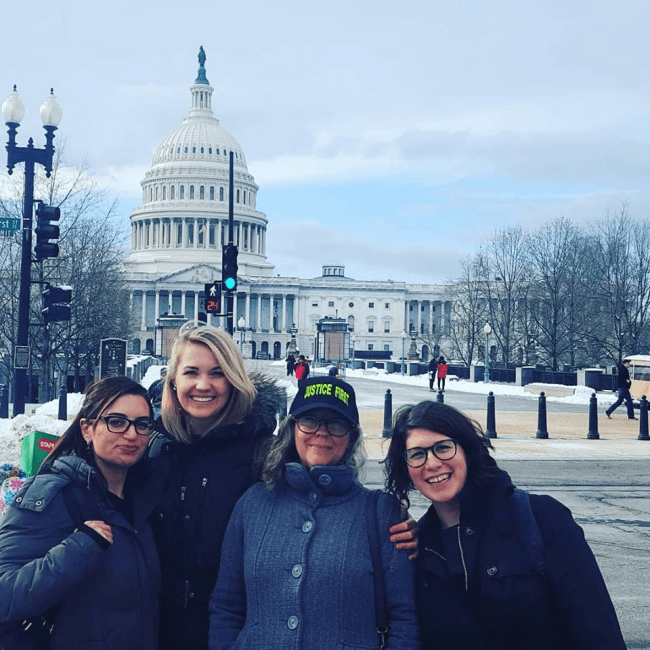 Earlier this year, Dogwood Alliance traveled to Washington, DC with the Justice First Campaign to bring our shared vision of forest protection, clean energy, and climate justice to the halls of Congress. We put the Stand4Forests platform in the hands of several congressional offices — climate leaders who want to see ambitious climate legislation on the federal level. Based on the best scientific evidence, any comprehensive climate action plan needs to protect our forests as well as tackle the alarming rate of forest destruction currently happening in the US. We asked them: become a Stand4Forests champion. Now, it’s time for lawmakers in DC to hear from you. I live in Congressman David Price’s district, and today, I called his office and asked him to be a Stand4Forests champion. I’m asking everyone I know and everyone reading this to join me in calling your Representative and Senators today. By joining the growing list of supporters, policymakers who endorse the Stand4Forests platform will be taking a stand for principles anyone can get behind: clean air and water, protection from flooding and storms, the green economy, biodiversity, and the charge to solve the climate crisis. Every call makes a difference. We know that lawmakers hear from the forest products industry and their friends every day. Profit-driven groups and companies like Enviva, the world’s largest wood pellet manufacturer, benefit from the status quo of the forest products industry. These industry players want policymakers and the public to believe that we can log our way out of climate change. In fact, just the other day, forest industry sweetheart, Arkansas Representative Bruce Westerman, tried to win over The Hill’s readers with the faulty logic that if you want to save a tree, you should… cut down a tree? We’re not falling for it. The truth is that to avoid a climate disaster, real leaders will have to address one of the biggest climate emergencies we have: logging. Every day of the year, Dogwood Alliance celebrates and champions our forests. We fight for the clean air and water they provide, the beauty they share, and the protection they give us from flooding and storms. More than ever, we fight for forests because they are essential to solving the climate crisis. On March 21st each year, the International Day of Forests gives us a reason to celebrate a little louder. Happy International Day of Forests! 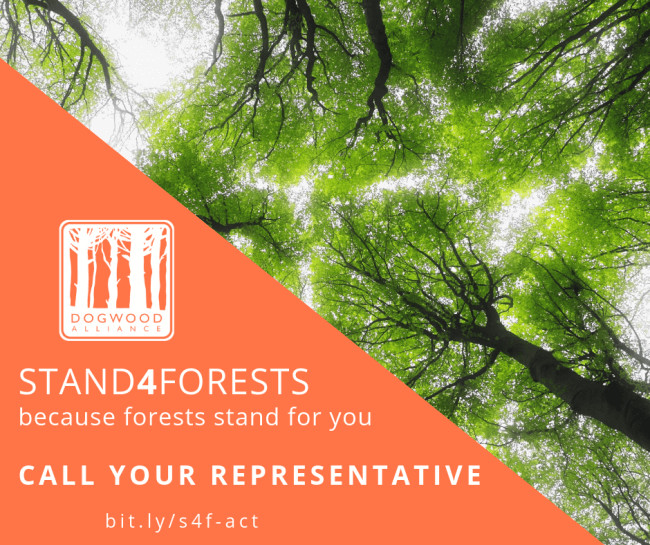 Call your Representative today, and tell them to be a real climate leader: Stand4Forests. If you haven’t already, be sure to sign and share the Stand4Forests pledge! Join the conversation on social media with the hashtags #Stand4Forests and #IntlForestDay. Rachel’s driving passion as an organizer is her commitment to environmental justice and building people power. While attending Duke University, where she earned her BA in Public Policy, Rachel interned for two summers with Dogwood Alliance, working on the Carbon Canopy Project and the Our Forests Aren’t Fuel campaign. Inspired by Dogwood Alliance’s vision and mission-oriented work, she served as a Youth Board Member on the Program Committee. A native New Yorker, Rachel’s found home is in North Carolina, where she loves to hike, write, and practice yoga.